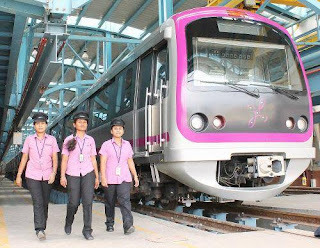 Bangalore Metro Rail Corporation Ltd (BMRCL) Job notification has released for various vacancies. Want to apply for it? It has announced for vacancies such as Maintainer, Junior Engineer & Section Engineer. Check below complete details. SC / ST and Cat-1 – Below 40 yrs. IIa, IIb, IIIa and III b – Below 38 yrs. There shall be no negative marking in the written examination. The question paper will be bilingual i.e. in English and Kannada and the duration of the examination will be for 2 hours with 100 questions. The question paper will also contain writing one paragraph/sentence in Kannada which is compulsory. Shortlisted candidates will be called for verification of the original documents and Kannada test followed by Medical Fitness Test, if cleared in the verification and Kannada test. Examination Centre: Bangaluru, Mysuru, Belagavi and Kalaburagi. All interested and eligible candidates apply for this position in online latest by 2 February 2019. Date of written test: 24th February 2019 (Sunday).